Supernatural fans, eat your heart out. 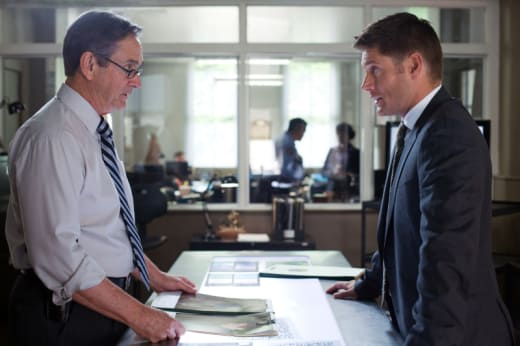 This essentially one-off episode about organ transplants, Mayan gods and bloody beating hearts was not only directed by Jensen Ackles, Mr. Dean Winchester himself, but it even starred his father, Alan Ackles. There was an obvious resemblance and it was clear pretty quick that Papa Ackles can hold his own against Dean. Talk about entertaining Acktion. It's actually pretty impressive that Ackles was in so much of this episode considering that he was directing. When he first did "Weekend at Bobby's," Ackles popped in here and there, but the brunt of his presence was behind the camera. The same could certainly be said for last season's "The Girl Next Door," allowing for much of the focus to be on Sam and his past love. Yet "Heartache" featured a lot of Dean screen time and I could tell that being the one in control allowed Ackles to do exactly what he wanted, from giving subtle facial expressions, like his eyebrow raise when Sam was raving about his favorite football player; or starting the episode off with a nice creepy tone via shots of the runners on the foggy path. And they say that jogging is good for you. Right. The case itself was interesting and had a pretty classic feel to it. I had no idea what was going on with the killers besides thinking maybe it was a shifter, but I liked bringing in a Mayan god ritual through the organ donors while putting some spin on a 1000-year old sports superstar. It was even enjoyable getting the throwback about the professor helping them with the amazons now assisting them with the unknown language. That was the episode where Dean's one night stand had gone awry, remember? I was a little disappointed in the final fight, especially in that the two organ donors seemed to have forgotten about Sam after hitting him once. Clearly at his size, Sam doesn't do a classic TV knockout. Yet, what some fans might be groaning at, which I rather enjoyed delving into, was the continuing look at Sam and Dean's changes after one year. It's obvious that Dean has come back with a focused warrior mind, knowing what he has to do in order to save the world. At the same time, Sam's had a very long time to experience something he never got the chance to have when Dean showed up on his doorstep eight years ago in the pilot: a real life. In a way, it's a lot like the brothers are retaking up their roles with which they first started the show. So, it makes sense that Sam is the one to embrace normal life more so than when Dean did in Supernatural Season 6. Dean, as much as perhaps he thought he wanted it, was never cut out for it. It's interesting that Sam is applying to colleges and that he openly tells Dean that he is okay with quitting after Kevin and the Demon tablet. Will he actually do it? I hope not because I'd like to see a few more seasons of Supernatural! And while I am able to understand and acknowledge where Sam and Dean come from in their respective thought processes, the flashback that was supposed to really show Sam happy and comfortable with that life fell a little flat for me. For whatever reason, maybe it was the heavenly glow or the line about never seeing a birthday cake before, I kept waiting for Sam to turn to the camera and start talking about some drug or medication we should take, much like he did in the episode "Changing Channels." Maybe it seemed too happy and tonally was vastly different from the dark episode or more specifically the dark Impala in which Sam was pondering, but I couldn't help but want to laugh. It just felt a little cheesy. I guess I'd just really like Sam's flashbacks to be as engrossing as Dean's, even if one is about fighting in Purgatory and the other supposed to be something of a sweet love story. But I do like that it wasn't overused to try and backup what Sam was thinking because his conversations and attitude conveyed it in the episode. Although I wouldn't say it was my favorite Supernatural investigation, the hunt for the heart killers worked fine and Jensen Ackles delivered on the director's front. Now I just wonder if Jared Padalecki will be following in the director's footsteps any time soon. What did you think of the episode and Jensen Ackles' third time in the director's chair? As always, sound off below! Permalink: Smell that? Dude, you're gross. Wow. For a 95 year old, Brick Holmes could take a hit. Permalink: Wow. For a 95 year old, Brick Holmes could take a hit. 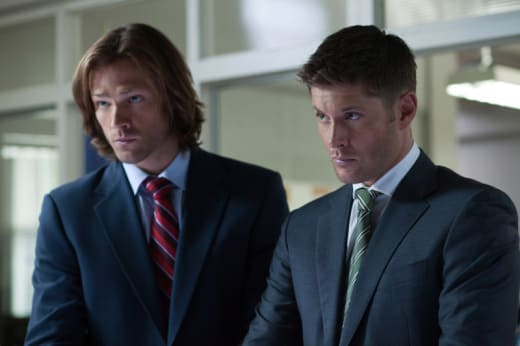 Supernatural Pictures & Promo: One Final Mission?